Many people do not know that the energy we use to power our buildings and vehicles has an important impact on our lives. Fossil fuel based energy (like gasoline, coal, oil, and natural gas) generates pollution that causes acid rain, smog, and global warming. The more we use, the more we pollute. The less we use, the less we pollute. Being energy-smart in your home and your school not only saves you money, but it helps the planet, too. We can all do our part to keep our planet clean so that children born today can live to enjoy a healthy planet tomorrow. Our world is full of choices, so choose to do more with less. Using less energy reduces pollution and conserves land needed for the expansion of power plants and infrastructure. One of the easiest, cheapest things to do is change your light bulbs. Did you know that the average incandescent light bulb wastes 90 percent of its energy on heat? Have you ever touched a light bulb while it’s on? They are hot! Ouch! That heat is a form of wasted energy. Newer versions of light bulbs use less energy and save money. Whenever you can, use light from the sun, not a light bulb. Problems with windows like glare and solar heat gain have been corrected through technology such as window glazing. This allows more people to use "day lighting," which promotes well-being and makes us more productive. In buildings, it saves money on energy costs. Did you know that a lot of the energy your mom & dad pay for to heat and cool your home is actually wasted through leaky windows and poor insulation? You always use the right tool for the job, so make sure you use the right materials, too. Keeping a tight building envelope (walls, floors, and roof) reduces inefficiencies in your heating, ventilation, and air conditioning (HVAC) system, which consume large quantities of electricity. Click here to learn more about how the building envelope can save you money and help the environment. The main objective of Energy Tools for Schools is to actively involve all schools in the process of reducing electrical usage at their facility. Broward County has a number of programs in place to make the schools efficient. This not only improves our environmental impact, but it saves money. The main objective of Energy Tools for Schools is to actively involve all schools in the process of reducing electrical usage at their facility. This program requires that each school select a staff member to be an Energy Coordinator. The Energy Coordinator will work with the District's Energy Conservation and Utility Management department to implement a plan to conserve energy at their school. The plan requires a team oriented process with direct involvement of other staff members and/or students. In it's inaugural year, fiscal year 2008/2009, Energy Tools for Schools contributed to a reduction from the previous year of 42,216,261 Kilowatt hours (kWh). This equates to an overall reduction of over seven percent, resulting in a cost avoidance of $4.5 Million dollars!! One of the main ways the District is saving electricity is through a program called “Performance Contracting”. In 1998, The School Board of Broward County, Florida (SBBC), issued “RFP 98-379V, Energy Management Performance Contracting Services.” The purpose of the RFP was to identify and select the most qualified energy services contractors to perform retrofits to our schools, which would reduce the District’s utility usage. A SBBC Evaluation Committee selected four successful contractors to initiate the first phase of Performance Contracting. Initially, a total of 30 schools were divided among the four contractors. The Board approved and issued a Technical Energy Audit Agreement to the contractors, who survey their schools and perform Technical Energy Audits. Next, BCPS staff reviews the audits and determins which energy conservation measures to move foward with. Then, an Energy Services Agreement is submitted to the Board for approval and work is begun. Once work is completed, the savings measurement and verification begin. The Energy Services Contractors’ staff, which include State licensed engineers, prepare monthly measurement and verification reports. These are reviewed by District staff that is trained on the utility bill comparison software, mechanical/electrical engineering calculations, and other manual savings calculations. If the measured savings do not meet or exceed the savings guaranteed by the contractor, then the contractor must write a check to the District to cover any shortfalls. The Performance Contracting program is extremely successful – as of October, 2009, 111 schools have been retrofitted, and $15.5 Million dollars have been saved/avoided in lower utility and operational costs. Schooldude "UtilityDirect" is the District's online, web-based utility tracking software. This web-based software allows each school in our District to have direct access to their monthly electrical usage. With access to their monthly electrical usage, schools are able to compare the current year's usage against last year's usage. By tracking their month-to-month electrical savings, schools can actually measure the progress and success of their efforts to conserve electricity. Schooldude "UtilityDirect" provides powerful reporting tools that allow staff of the Energy Conservation and Utility Management department a better way to analyze, track, and audit utitlity data. These reports allow District staff to identify utility waste, cost and meter problems, and billing errors. Being able to identify these problems has allowed our District to reduce utility consumption and cost. Change your light bulbs. Replace wasteful incandescent bulbs with energy efficient compact florescent bulbs (CFLs) or cool new super-efficient LED lighting. 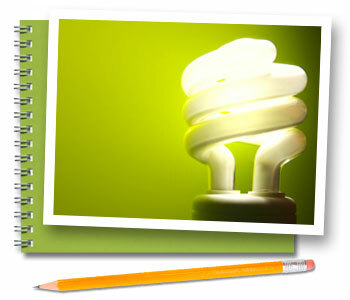 Learn more about CFLs and LED target="_blank">here. Open the blinds. Install a skylight. Use day lighting instead of electric lighting. Use motion sensors. Motion sensors turn off lights when no humans are in the room. Turn the lights off! Yes, it makes a difference! The lights do not need to be on when you leave the room. Set your thermostat. Keep it at 78ºF in the summer and 68ºF in the winter. Even a few degrees make a big difference on heating and cooling bills. Update your Air Conditioning. Do you have an old outdated air conditioner? New models are dramatically more efficient. They cost more up front but save you hundreds of dollars in reduced electricity bills. Insullate. Chose well insulating materials in your walls, doors and windows. Visit our building envelope page to learn more. Purchase EnergyStar rated appliances. EnergyStar products are designated by the Environmental Protection Agency (USEPA) and the US Department of Energy (USDOE) to be energy efficient. target="_blank">Click here to learn more. Talk about it! Notice that your sister is leaving the lights on? Do your friends leave the refrigerator door open? Tell them! It makes a difference.